Jigglyboobs, I choose you! If you don’t mind getting the occasional stare from random Pokemon fans in public, then this hilarious Jigglypuff crop top could be the perfect addition to any girl’s wardrobe. What do you think Jigglypuff so upset about? Calm your nervous twitch before taking on the Elite Four with one of these Pokemon fidget spinners! Available in a range of different Pokeball types, each fitted with bearings that allow you to easily spin the gadget in between your fingers. 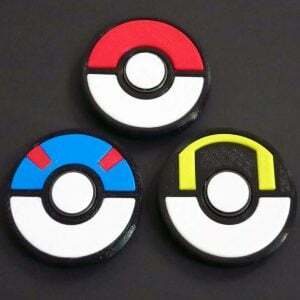 Carry a small piece of your childhood wherever you go with these Pokemon Trading Card keychains! Each handmade charm is designed to look exactly like the classic collectible Pokemon cards. Always stay prepared for a Pokemon battle!